Monday, Monday....this feels like the first Monday of the year because it's all back to the real world schedule now. Am I right? 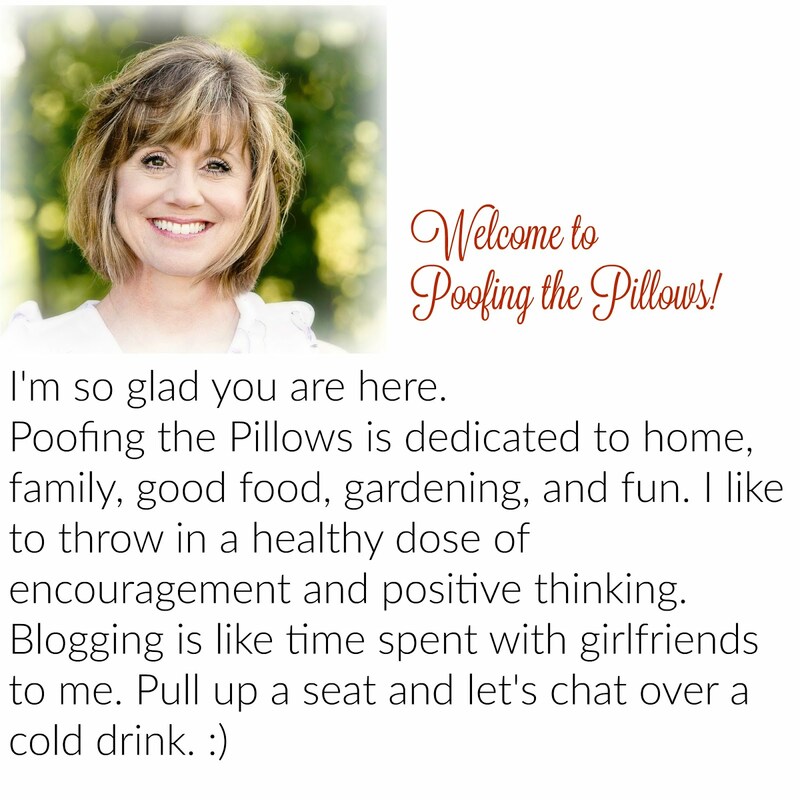 My sweet blogging friend Andea @ Living on Cloud Nine invited me to join this fun linky so here we go. Now you be sure to join in too or leave your comments below. 1. Resolutions or No Resolutions? I make them...I break them. This year is off to a slow start for me but I'm gearing up for the annual weight loss of 5 lbs. Every. Single. Year. I blame it on the pie!! I am going to make sure to work on my word of the year goals. 2. Love Snow or No Snow? Texans here! We love it for one day and then summer is welcome to return. 3. Name a place you want to go this year. My hubby and I are celebrating our 30th anniversary this year. In all the world with its exotic locations we've chosen to go to California to see the ancient Redwood Forests. Can't wait! 4. Would you rather have a new haircut or color? Please don't make me choose! My hair grows like a weed patch...a weed patch with gray weeds interspersed! 5. 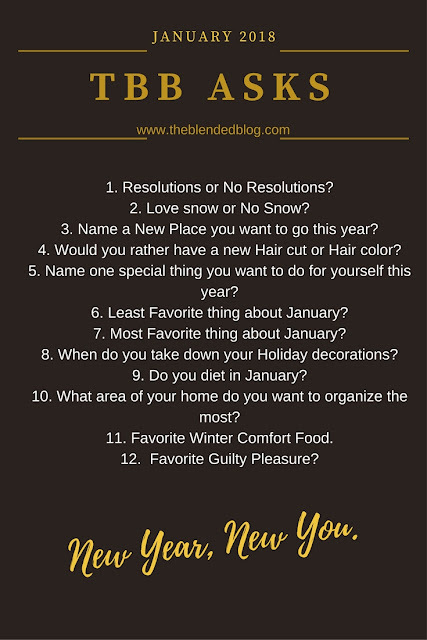 Name one special thing you want to do for yourself this year? Well there's #1 and then I want to have more fun! We tend to take things a little too seriously around here. 6. Least favorite thing about January. It's cold. Period. Oh yeah, my jeans are snug. 8. When do you take down your holiday decorations? Quickly! As much as we love and adore Christmas at our house, it feels so good to take all the excess stuff away and declutter. 9. Do you diet in January? Sure! Except for when I forget and eat pie. I don't enter those slip-ups on my Weight Watchers app. Do you? 10. What area of your home do you want to organize the most? The part of our lives that needs to be organized the most is paperwork. I used to be so efficient about it but in the last year or so, I just hide stuff in the drawers and hope it disappears. It doesn't. The week after Christmas I made myself get it all in order. It feels so good! 11. Favorite winter comfort food? Mashed potatoes...no wait....cornbread....no wait....chili....oh I know ...Mexican food! 12. Favorite guilty pleasure? Hasn't this mostly been about that? Yikes! My favorite guilty pleasure is probably shopping or dessert. Don't make me choose. Hi Stacey... you named two more of my guilty pleasures. My Jeans are also more than snug and I hate cold weather. But lucky for you, your cold weather will not last nearly as long as mine. Hope you have a great week!! I love these little lists of questions. We are headed to San Francisco in March and will branch out from there to either the Redwood National Forest or Yosemite. have a wonderful day! Yes! Sooo happy you joined in the fun! I loved reading your answers! I wondered what was planned for the big 30th? The Redwoods are a dream of ours too, maybe we’ll save it for our 30th! Your Mr’s cornbread!! ;-) Have a great week! I've enjoyed reading a few of these! I always like getting to know people more through their answers! Love reading everyone's answers! A trip to Cali and the Redwoods sounds amazing. We will celebrate our 30th this year too. Oh, I love your guilty pleasures and the pie! Enjoy, my fellow Texan! Cute post. Good luck with your new year goals. Your trip sounds fabulous. Fun Q&A!!! :D We need to move so I can donate lots of stuff. Stacey, this was a fun post! You will love seeing the redwoods. We have our anniversary in February, I am trying to decide where we might go! What a fun post. I love decluttering too, and I still need to make 2018 folders for gathering all that paper that I can't shred. You have hit on a few of mine too. My jeans yep very snug and need to get at lots of paper work still in packing boxes from our move. The biggest one is the cold in January!!! We unfortunately here in the midwest get that cold and snow for three months not one day like you Texan's. Would love that sweet weather you guys have through these next few months. Happy New Week. It's always fun to think about and fill out questionnaires like this. They make you think. I'm with you on the snow, the haircut, and the Tex~Mex. What to people in NOrth Dakota or Iowa or Wisconsin eat? Can't live with Southern cuisine and Tex~Mex. This is such fun and I always enjoy reading everyone's answers. Yes, to lose 5 lbs, that's a good idea. :o)) Happy week! I loved every last word, so cute and enjoyed it, thank you. This was a fun post! I enjoyed reading all of your answers. Clearly, we have the same taste in comfort food. My answers are similar to yours, I do like winter, however, because I love sitting in front of the fire, all wrapped up in a nice afghan with a good book. My guilty pleasure is British television. Let's not talk about what doesn't get entered in the Weight Watchers app - LOL! i'd love to go see the redwoods - have a great trip! That is a fun questionnaire but I found lots of questions I would have multiple answers for! Love your answers....you made it fun to read.